Winter is on its way, and for Holton-area drivers who find themselves driving 20 miles or more from home to work, the father and son team of Scott and Jordan Foster have good advice to follow to make sure that cars and trucks don’t break down in the cold. In addition to routine check-ups, the elder Foster also recommends replacing any belts and hoses — or “anything that keeps the engine running” — when severe wear on those belts and hoses is apparent. “Anything that could break and leave you stranded on the road should be checked,” he said. Scott Foster also recommends changing out fuel filters, in order to keep moisture in the fuel line from accumulating and causing a blockage. And in the event a car or truck should break down, he also recommends having a winter emergency kit packed with a blanket, flares and reflectors. “A can full of sand and salt to help melt the ice is also good to have,” he said. 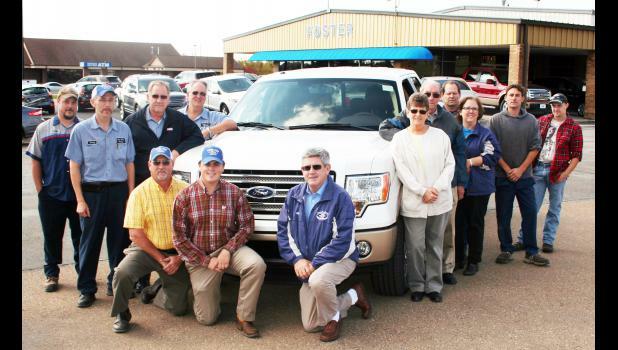 The Foster family spans three generations of commitment to excellence on and off the road, with its origins in Horton. That’s where Ray Foster, Scott’s father, ran an auto dealership from 1954 to 1988. Scott Foster said the building that currently houses Foster Ford-Mercury was purchased in July 1985. At that time, he had two full-time employees and a part-time secretary who also worked for Ray Foster, but since then, the employee roster at the Holton dealership has grown steadily. Some of Foster Ford-Mercury’s employees have been around for more than a decade, and Scott has previously attributed that to a commitment to “hire people for life” and provide positive working conditions. Today, one of those employees is Jordan Foster, the third generation of Fosters involved in the dealership, working in sales. Jordan’s full-time employment at the dealership began following his graduation from Manhattan Technical College with an associate’s degree in business administration. “It’s something I’ve wanted to do since I was old enough to think about whatever I wanted to do, to work with Dad and Grandpa in the family business,” Jordan said. And does Scott Foster see his son taking over that business at some point? “I hope so,” he says with a laugh.